We usually have regular stock of our products in our warehouse, (for example, ultrasound imaging system, veterinary ultrasound scan for swine, ovine, goat, alpacca, or large animals or small animals, we usually ship the goods within 1 to 5 working days since we receive your payment, or a payment proof, or the Irrevocable Letter or Credit (for big orders only) confirmed ok.
As you know, it usually takes 1-3 working days for us to receive the payment since you wire transfer it in your local bank or online. For small orders ( total weight less than 45KG) We will hand over the goods to TNT, DHL, FEDEX within 2 days, in another 4-7 days, you will receive them. 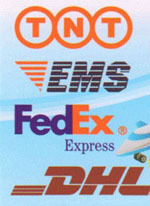 We will give you TNT,DHL, FEDEX Tracking Number for your own tracking-up at their offical website: www.tnt.com, www.dhl.com or www.fedex.com. For Medium Orders( total weight over 45-500kgs), we usually deliver the goods by Air logistics in order to save you freight charges. we'll email you a copy of Airway Bill within two days after we hand over the goods to our Air forwarder.